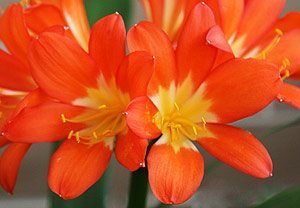 If you are looking for a shade loving plant that will provide a bit of life when in flower then yellow flowering clivia plants could well be the one. The large flower heads with masses of trumpet shaped flowers provide a highlight from late spring to early summer. 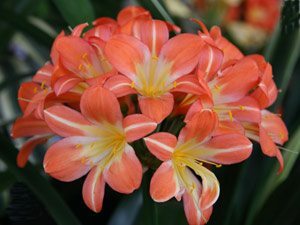 The yellow flowering clivia available for sale vary both in colour and flower form. With yellow C. miniata, Belgian hybrids as well as many Japanese and South African types the choice is wide. Some are carefully bred from selected yellow forms and are then divided, others are bred from seeds and flower colour is not always consistent. With names such as Vico yellow, which was the very first Cliva successfully propagated by tissue culture. This is a variety also one of the plants used in hybridisation in Japan by some of the well known growers such as Mr Nakamura. Not all yellow clivias are the same, for example Clivia citrina is a real lemon yellow, while Clivia miniata ‘Yellow Toshie’ (pictured above right) is a paler yellow. Although yellow Clivias were expensive a few years ago, prices have dropped markedly. The multi coloured Clivia with yellow throats and pastel tones are also becoming more popular. So when you are looking for a ‘Yellow Clivia’, if you choose a specialist supplier you will have a range of tones and flowers forms to select from. For mass planting look for young plants, these will be cheaper than mature flowering size yellow clivias. These plants require the same care as other clivias, and in general this means light shade and a well drained soil. The only other care is the removal of any old dead foliage and to watch out for pests. 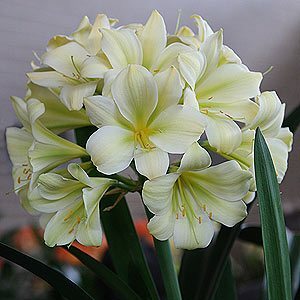 You can divide mature clumps of yellow clivia in spring just after flowering, make sure you take some roots and try not to damage the base of the plants.